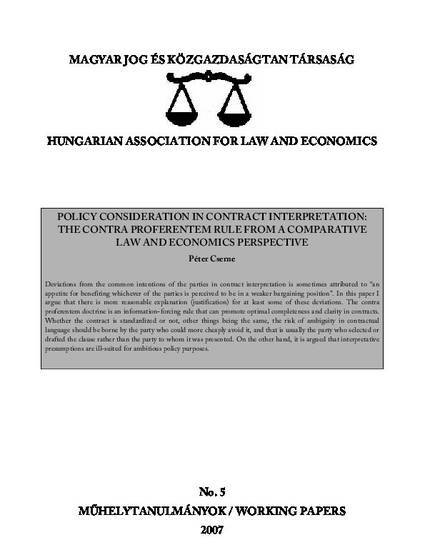 Deviations from the common intentions of the parties in contract interpretation is sometimes attributed to “an appetite for benefiting whichever of the parties is perceived to be in a weaker bargaining position”. In this paper I argue that there is more reasonable explanation (justification) for at least some of these deviations. The contra proferentem doctrine is an information-forcing rule that can promote optimal completeness and clarity in contracts. Whether the contract is standardized or not, other things being the same, the risk of ambiguity in contractual language should be borne by the party who could more cheaply avoid it, and that is usually the party who selected or drafted the clause rather than the party to whom it was presented. On the other hand, it is argued that interpretative presumptions are ill-suited for ambitious policy purposes.